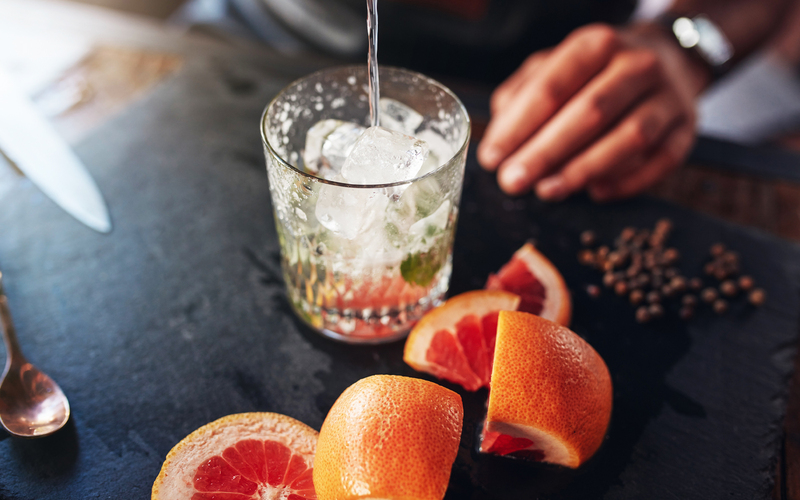 Mixed drinks are both creative and delicious, and they can also be the latest addition to a cannabis enthusiast’s elevated repertoire. Infused sparkling sodas and waters are filling the market, making them the go-to element for swapping out alcohol with a refreshing dose of cannabis. The result? Canna-cocktails that will delight your senses as well as your taste buds. Below, we crafted five cannabis infused “cocktails”—including a delectable sangria and blood orange basil spritzer—that you can mix for yourself or impress your guests. Note: The following recipes can and should be modified to suit personal dosing needs. If you need to add less cannabis infused drink than what the recipe calls for, substitute with a similar flavored seltzer or plain seltzer water. Using a muddler, add basil to the bottom of a sturdy glass along with half a glass of grapefruit juice and muddle until the basil’s fragrance is released. Add ice to the glass and fill the remaining space with blood orange Keef Sparkling water. Stir gently once to combine. Finally, using a toothpick, spear a basil leaf onto a slice of orange and garnish drink. Enjoy!